Yesterday I was sitting learning Khmer (attempting to anyway) with one of my first friends in Siem Reap, Sophoan. An amazing, powerful young women who had my back right from the start of my time in Siem Reap. While we were eating lunch together a lady came past, around 70 years old. She was begging, not money but food. I couldn't understand as my Khmer is rubbish, but Sophoan gently told the lady to take a seat next to us while the shop prepared her lunch. I've got to say that it’s been a while since I have been out in the village or even seen that level of desperation in front of my eyes. The new job and life in general has shown me a slightly more sheltered view over the last 6 months. When I asked Sophoan why she decided to help this lady - she said that she reminded her of her mum and she couldn't not help. It’s been quite a while since I last shed a tear whilst writing an email, but I am just reminded how hard life continues to be for people here in Cambodia. I think of my own amazing Mum, or even Nan who have supported me through my life and 1step. Although Christmas isn't celebrated here, imagine being that lady at a time of year which is celebrated. Alone, begging and vulnerable. It comes back to the same thing every time though right - you can't help everyone. What you can do is make a difference in the way you know how, each and everyday. Sophoan’s small action at lunch might have made this woman's day just a tiny bit easier. It took nothing for Sophoan to show a bit of respect and to welcome her to share a meal, but for the lady it could have meant the world. I think the term "random" or "small" acts of kindness is a bit overused, but in reality I saw that unfold yesterday and it broke me. A girl who I have been friends with for years - has never made me so proud. I thought about what I and all of us are doing to help in the way we know how. My sadness was replaced with pride that we are helping to avoid another generational wave of hardship and poverty and I was reminded of what a wonderful job we are doing. Last weekend Pheakdey and I gathered a few students to join a local rubbish clean up at a Pagoda. It was a morning full of laughter and fun with the students who could come. It amazed me, not having seen them for a few months, just how grown up they are all becoming. Those who have moved to the city have a growing edgy humour and can easily keep me in line! But all of them continue to be amazing, positive humans who have so much passion and energy for life, education and their future. As all of us Aussies sit down together at Christmas time, enjoying food, relative good fortune and family, I don't want anyone to feel guilty or sad for those living in Cambodia. 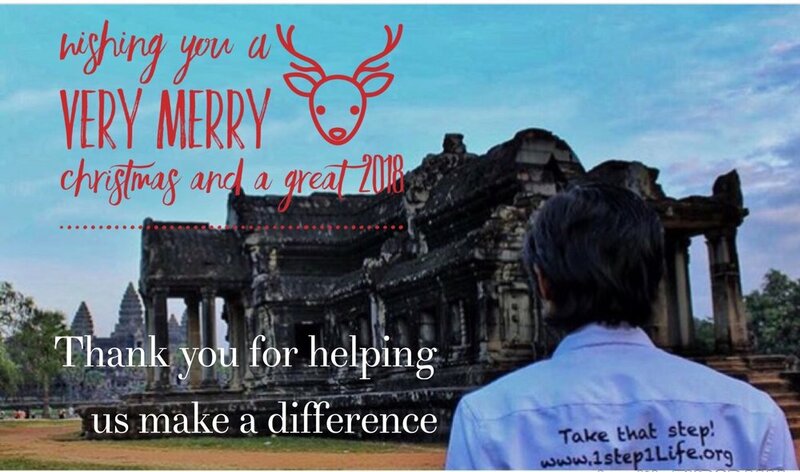 I want you all to embrace the day, the luck that we have been dealt and embrace the positivity that you have helped create the change in the lives of these amazing young people we call the 1step family. It has been a huge year for everyone involved at 1step - a year of major highs and major lows. But something that has never wavered is our complete commitment to changing the lives of those we can, here in Cambodia. I am looking forward to another year of amazing milestones as our 1step family grows another year older. Already we are seeing huge success with many students entering the workforce and gaining opportunities they would have been many years away from accessing, without our help. I can't wait to have another year of lending a hand, the way we know how! A big Merry Christmas to you all, much love and speak soon. Wishing all a very happy and safe Christmas with your family and friends and a wonderful year ahead. Thank you so so much for your continued support.